ECZEMA and ATOPIC DERMATITS: a common type of skin allergy. Atopic dermatitis is a very common skin disease that can produce tremendous physical discomfort and psychological distress. It is a dry itchy skin rash that tends to be worse in the winter and more dry months. The condition affects approximately 3 percent of the U.S. population and is also seen worldwide. Atopic dermatitis is frequently seen in individuals with a personal or family history of related history of related disorders, including allergies (hay fever) and asthma. About 20 percent of patients with atopic dermatitis don’t have any other associated allergic history. Skin lesions may begin at any age, although mainly from infancy to young adulthood. Most patients recover from the disease in early childhood or by their mid-20s. However, some patients’ disease may persist throughout life. Atopic dermatitis appears as a chronic, itching, superficial inflammation or redness of the skin. The typical skin lesions begin as a red rash with multiple small bumps and/or blisters. The most distinguishing features of the disease are the location and distribution of the skin lesions. In infants, the rash commonly begins on the face and scalp with red, dry spots. In adolescents and young adults, the rash typically occurs on the elbow bends (front of elbows) and back of knees. It is also seen on the face, neck, and upper chest in areas of skin folds. Many patients also have dry skin all over their body. 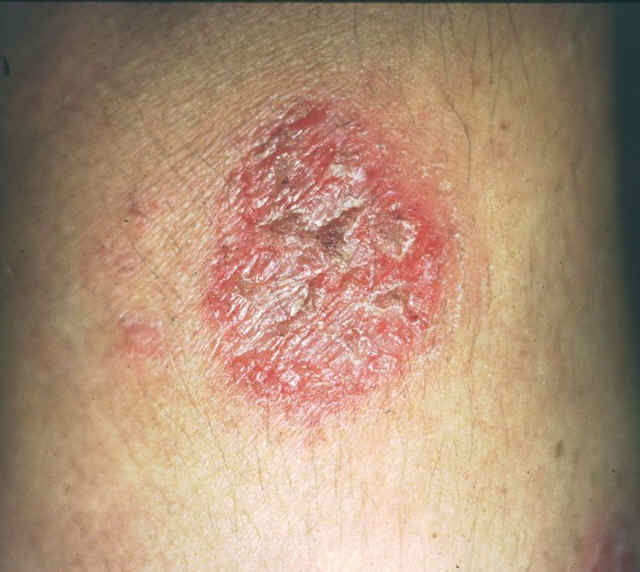 The initial skin rash can become intensely red, blister, ooze and form scabs.A common complication of the disease is secondary bacterial infection, which may often necessitate antibiotic treatment. Severe itching leads to repeat scratching of lesions – hence the “itch-scratch-rash-itch cycle.”, Because of the persistence of this itch-scratch cycle, the skin may become very thickened in these areas from rubbing. Severe and constant itching is the grand hallmark of the disease. The cause of the disease remains largely unknown, but an inherited or genetic pattern is often seen in families. Fortunately, there have been some recent innovations in this field by the introduction of dynamic, new therapies which involve non-steroid type of medications like Elidel cream and Protopic ointment. There is also new narrowband UVB light treatment to help with very resistant cases. These therapies have the advantage of avoiding some of the common bad side effects with steroid creams like skin thinning and long term skin changes. The term “eczema” generally includes many different types of skin allergies and rashes. The most common type of eczema is atopic dermatitis (AD). AD affects more than 15 million Americans of all ages. People describe eczema as the “itch that rashes”. We can see itchy dry patches of red skin, which sometimes get scaly and crusty. Eczema may be caused by either overactive or underactive parts of the body’s immune system. Most eczema patients actually have a hyperactive reaction to minor skin irritants and dryness. In fact, many people who have eczema also suffer from allergies or hay fever, asthma, seasonal allergies, and often have family members with similar symptoms. Medical UVB is a special light therapy available for very bad eczema. An advanced light form called narrow band UVB 311nm is the newest state-of-the-art UVB light treatment. This is called Narrow Band UVB light or NBUVB. Studies have confirmed that that NBUVB phototherapy is a very good treatment option for eczema and atopic dermatitis. Getting natural sunlight is not the same as using medical grade special narrow band UVB. Another therapy option includes UVA light or PUVA. PUVA requires a pill plus light wheras UVB does not require a pill. Your dermatologist can help find the best treatment fit for your skin care needs. Keep in mind that phototherapy is a safe and effective treatment option for eczema that has helped people just like you.